Welcome to the programming research group at NII! This laboratory is jointly run by Profs. Hu, Kato, and Tsushima (and thus also called HKT Lab). It aims at top-quality research on design and implementation of declarative programming languages, systematic construction of efficient programs (sequential and parallel), and automatic optimization of queries on XML and graph databases. Our lab starts accepting excellent students who want to study in Gradaute School of Information Science and Technology in University of Tokyo. 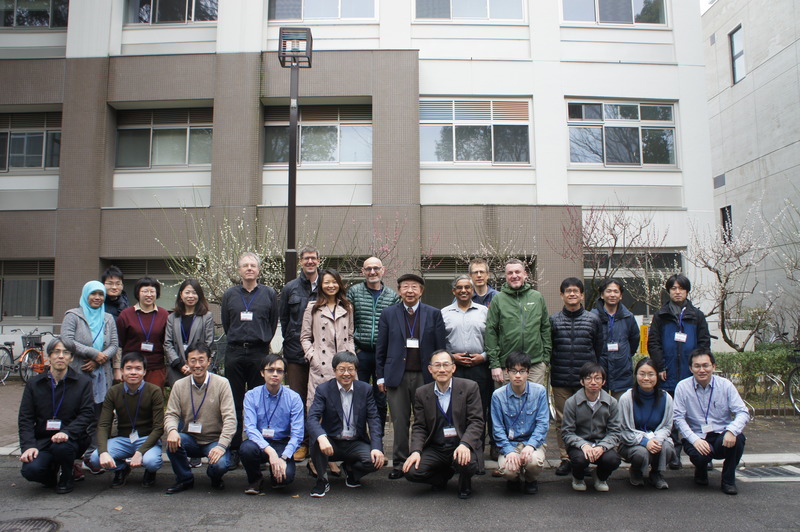 The First Workshop on Software Foundations for Data Interoperability was successfully held (program, workshop photo). Chunmiao Li's poster (joint work with Yijun and Zhenjiang Hu) “Collaborative Development Environment: Fusing Human Insights into Automated Program Repair.” got the Finalist Award at Student Research Competition in APLAS 17. Hsiang-Shang Ko and Zhenjiang Hu's paper “An axiomatic basis for bidirectional programming” is accepted for POPL 2018. Yongzhe Zhang, Hsiang-Shang Ko, and Zhenjiang Hu's paper “Palgol: A High-Level DSL for Vertex-Centric Graph Processing with Remote Data Access” is accepted for APLAS 17. Prof Nobuko Yoshida from (Imperial College London) will give a talk about "Behavioural Type-Based Static Verification Framework for Go". Hiroyuki Kato, Yasunori Ishihara and Torsten Grust’s paper “DDO-Free XQuery” is accepted for DBPL 2017. IPL seminar will start from 11 October (tentatively). Zirun Zhu, Hsiang-Shang Ko, Pedro Martins, Joao Saraiva, and Zhenjiang Hu’s paper “Parsing and Reflective Printing, Bidirectionally” is accepted for SLE 2016. Kento Emoto, Kiminori Matsuzaki, Zhenjiang Hu, Akimasa Morihara, and Hideya Iwasaki’s paper “Think Like a Vertex, Behave Like a Function! – A Functional DSL for Vertex-centric Big Graph Processing” is accepted for ICFP 2016. Weize Zhao, Haiyan Zhao, and Zhenjiang Hu’s paper “A Framework for Synchronization Between Feature Configurations and Use Cases Based on Bidirectional Programming” is accepted for MoDRE 2016. Tao Zan, Hugo Pacheco, Hsiang-Shang Ko, and Zhenjiang Hu’s paper “BiFluX: A Bidirectional Functional Update Language for XML” is accepted for JSSST Computer Software, 2016. Dr. Soichiro Hidaka moved to Hosei university as a full professor. Chong Li, Le-Duc Tung, Xiaodong Meng, and Zhenjiang Hu’s paper “Let High-level Graph Queries Be Parallel Efficient: An Approach Over Structural Recursion On Pregel” is accepted for IPSJ Transactions on Programming, 2016. IPL seminar will start from April 5th (Tuesday). Prof. Julia Lawall from Inria Paris will give a talk on March 10th about "Prequel: A Patch-Like Query Language for Commit History Search". Place:Room 2006, 20th floor (the room has been changed from 1210 to 2006). Chenglong Wang, Jiajun Jiang, Jun Li, Yingfei Xiong, Xiangyu Luo, Lu Zhang, and Zhenjiang Hu’s paper “Transforming Programs between APIs with Many-to-Many Mappings” is accepted for ECOOP 2016. The second Spring Festival Workshop on Programming Languages will be held on the 4th in February. Robin Dupuis, Kevin Colson, Lionel Montrieux, Zhenjiang Hu, Seastian Uchitel, and Pierre-Yves Schobbens’s paper “Reusable Self-Adaptation through Bidirectional Programming” is accepted for SEAMS 2016.